And like that, it was over. March Madness is put to bed for another year; all that remains for us to do is announce our Grand Champion 2019. We started back on March 19, with 64 locations facing off in four brackets: The Shire, The Hobbit, The Lord of the Rings, and The Silmarillion. Each round saw some fairly close fights, and some strange pairings (Lonely Mountain vs Misty Mountains! Bag End taking on Hobbiton!). In the very first round, what some say are Tolkien’s ‘two towers’ (Barad-dur and Isengard) faced off. The only battle which matched one found in the Professor’s books was in Round 2, when Fangorn Forest marched to Isengard. Alas, my personal favourite (the Green Dragon, naturally!) fell in Round 3. Of our two finalists, both started off with pretty easy journeys through the rounds. Early on, Numenor gave Gondolin the biggest challenge, but even they could only take 40% against the elvish city. In the fourth round, however, Gondolin faced tougher competition, and just narrowly defeated the other very strong contender from the Silmarillion bracket, Valinor. And in the Final Four, Gondolin again had a hard time of it, securing victory by just 3% over the Lonely Mountain! 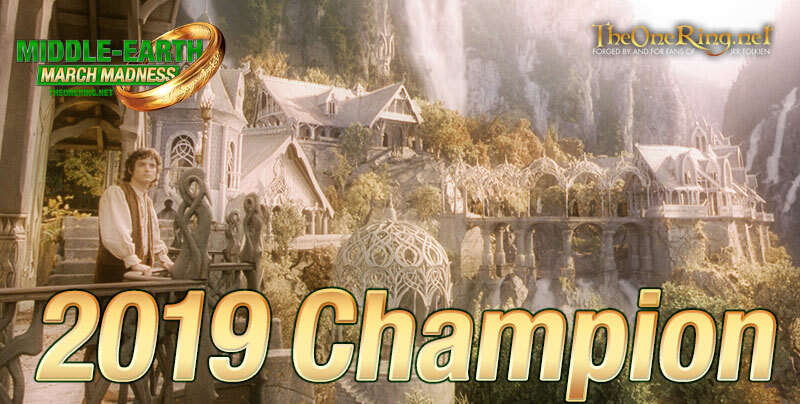 Rivendell, on the other hand, pretty much cruised through; even against Lothlorien, Elrond’s home in the valley was still able to take two thirds of the vote. 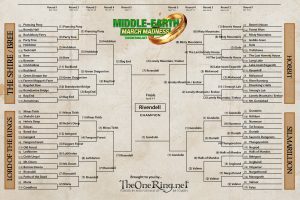 Did that make Rivendell the favourite in the epic final? 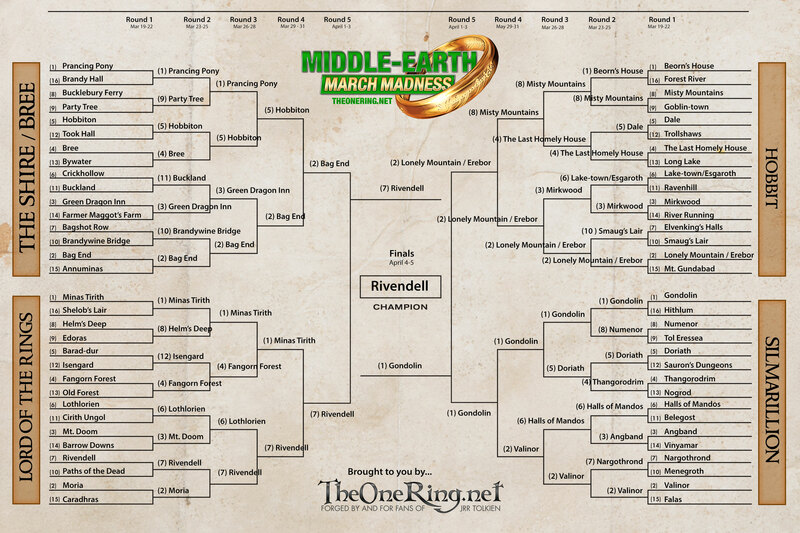 Yes, as the early rounds would seem to indicate, Rivendell was the firm favourite. They will be singing tra-la-la-lally there down in the valley to celebrate, no doubt! Many thanks to all of you who played along, voted, and commented. We always enjoy seeing folks taking part in our version of March Madness, and reading what you have to say. Let us know what you thought of this year’s theme in the comments below, or on Facebook. We hope you’ll join the fun again next year!